Welcome to The Statesman, an independent publication focused on global affairs. Western intelligence activity in the Middle East has influenced regional politics for generations. How did Lawrence of Arabia establish British intelligence in the Arab world during the First World War? The modern history of the Middle East and the Arab World is a complex tale of tribal and religious alliances and divisions, further complicated by relationships with outside forces. Two such outside forces, which had a great impact on the region in recent history, are the Ottoman Turks and the British Empire. At odds during the First World War, elements of these two powers, both of which occupied parts of the Arab World, rightly recognized the importance of the region in the ongoing global conflict. The majority of the British leadership saw the Middle Eastern Theatre of the Great War as a sideshow, overshadowed by the intensity of the European theatre that was consuming vast amounts of resources and racking up a very high number of casualties. The Middle Eastern Theatre was very different; rather, it relied on the ingenuity of a select few Englishmen and their ability to create an insurgency in the Ottoman Empire’s Arab population. The power, importance, and accuracy of the judgments of these men proved to be invaluable to the British and Allied war effort, despite the scepticism, or even objections, of certain elements within the British leadership. The skill, intuition, and bravery of men of the ilk of T.E. Lawrence, better known today as Lawrence of Arabia, however unorthodox, are legendary for their overwhelming success. Perhaps more importantly, T.E. Lawrence helped give rise to a burgeoning Arab national identity, which may otherwise have been obscured by millennia of tribal rivalries. The qualities of these legendary figures, fuelled and elevated by a combination of sophisticated intelligence techniques, covert operations, bold military manoeuvres, and cultural integration on the part of Lawrence, empowered the Arab leadership, particularly the Hashemite family of the Sharif of Mecca, and emboldened the Arab populace to revolt against the Turkish occupiers. The main drivers of Allied victory in the Middle Eastern Theatre of the First World War were the intelligence officers of the British military. These men employed a number of very successful intelligence techniques to create and sustain a revolt among the Arabs of the Ottoman territories. The human intelligence gathered from men on the ground, the signals intelligence gathered by intelligence officers in the region, and the imagery intelligence gathered from above the ground were all vital to creating, sustaining and supporting the rebellion. The intelligence officers and operators in the service of Britain changed the course of the war, the region, and the history of the entire world. The skilful use of intelligence techniques by British officers and their Arab partners was vital to the success of the campaign in the Arabian Peninsula and the Levant. T.E. Lawrence, or Lawrence of Arabia, was perhaps the most successful example of British intelligence in the context of the Middle East campaign. Initially employed to survey Palestine for the British military under the guise of an archaeological survey, he and his companion published a report of the expedition titled The Wilderness of Zin. His time in the Arab World was an intelligence-gathering mission almost from the very beginning. His background as an archaeologist specialized in the Middle East would later serve him well in his military career, having previously learned Arabic and been familiarized with Arab and Bedouin culture. His cultural and historical knowledge of the region, along with the techniques he used in his archaeological pursuits, translated well into his new role after being co-opted by the British war effort in the region. His role would, of course, change and grow increasingly vital to the war effort, but he remained at the centre of the British intelligence community in the Middle East theatre until the defeat of the Ottomans. Lawrence participated heavily in both the planning and execution of military operations during his time in the Hejaz, the Levant, and Mesopotamia. His boots-on-the-ground approach was of vital importance to the development of a close relationship between the British and the Hashemite tribal leaders. It was this relationship that allowed the British to have a role in promoting and supporting an Arab uprising against the imperial Turkish occupiers. The uprising directed by Hussein bin Ali was motivated by personal reasons, not only by British encouragement. He feared being deposed and replaced with another man more favourable to the Ottomans, and reneged his allegiance to the Ottoman throne. Although the revolt initially had its roots without British involvement, the viability of Hussein bin Ali’s uprising was questionable without support. Lawrence’s development of a personal relationship with the Hashemite leadership allowed the young British intelligence officer to have an impressive amount of influence on events in the region. Lawrence’s bold suggestion of having the Arab armies attack the Turkish port stronghold of Aqaba from land impressed the Arab leadership, and proved to be a resounding success and one of the greatest victories of the campaign. The Turks had fortified Aqaba, but only from naval attacks on its Red Sea coastline. Aqaba bordered the Nefud Desert, which the Turkish defenders believed to be too harsh an environment for any army to cross. Lawrence, along with one of the Arab leaders, Auda Abu Tayeh, who would recruit fighters from the Bedouin tribes of Syria, dared to cross the desert with an army great enough to capture Aqaba with minimal resistance from the landward side of the port city. This is particularly notable because Abu Tayeh was formerly aligned with the Turks, but Lawrence and Prince Feisal were able to change his allegiance to the growing Arab resistance. It was Lawrence’s reputation among, and integration with, the Arab forces and their leadership that allowed him to go beyond his regular duties as an intelligence officer and fill the role of military strategist. Lawrence’s prowess in his role as an intelligence officer, along with his combat proficiency, earned him the respect of his British colleagues, but more importantly it earned him a legendary reputation among the Arab soldiers and their leadership. He was so respected by the Arabs that at one point during the war, the Ottomans placed a bounty on his head of 15,000 GBP, and no Arab ever attempted to claim it. It was this great success at Aqaba that convinced his superior, General Allenby, to promote him and adopt his strategy for the continuation of the revolt. His in-depth knowledge of the situation on the ground was unsurpassed by his British cohorts, and he served both British and Arab interests with zeal and skill. Relegated to relative obscurity when compared with the legacy of T.E. Lawrence, the Arab Bureau of the Cairo Intelligence Department, itself a department of the Foreign Office, played an important role in the Middle Eastern Theatre of the First World War. Overshadowed by the strategic importance of the Western Front and the larger war in Europe, the staff of the Arab Bureau, which included T.E. Lawrence, came from a wide range of backgrounds. They combined their various skills to successfully conduct intelligence gathering and analysis in the Arab territories of the Ottoman Empire. Through their Cairo office, they handled intelligence officers in the field, collected and analyzed imagery intelligence from the planes in the region, and intercepted signals intelligence from Turkish communications in the region and from broader German-Turkish communications. The Bureau had a number of objectives, one of which was to direct public opinion of the Arabs in favour of Great Britain. The British propaganda machine in the Arab World, under the direction of the newly created Arab Bureau and its chief obviously sought to sway the Arabs away from the Ottomans, but it also sought to create a British sphere of influence in post-war Arabia. The intelligence officers of the Arab Bureau were already planning to divide post-war Levant and Mesopotamia into British and French spheres of influence. This plan was the result of the 1916 Sykes-Picot Agreement, an agreement negotiated by Sykes and his French counterpart, Francois Georges-Picot, and signed by Briton Edward Grey and Frenchman Paul Cambon. Although this agreement was secret until Russian revolutionaries revealed it to the world in late 1917, it was a major driver of British policy in the region. It directly contradicted the McMahon-Hussein correspondence between the British High Commissioner in Egypt and the Sharif of Mecca, which planned for the establishment of an independent Arab state after the defeat of the Ottoman Empire. T.E. Lawrence attempted to convince the British leadership to honour their promises to the Arabs and abandon the agreement with the French, but to no avail. Instead, he found it helpful to confide in Prince Feisal and tell him of the post-war plan in order to ensure Feisal would strengthen his position during the war, so the British and French would not so easily push him out. Regardless of which agreement Lawrence favoured, his proficiency in his work greatly promoted sustainable British influence in the region, especially in the areas controlled by the Hashemite family. The Foreign Office’s intelligence operators and officers in the Near and Middle East, including Lawrence, Sykes, and many others, conducted intelligence gathering, analysis, policy advocacy, and military leadership of British and Arab soldiers alike. The success of the intelligence officers of the Arab Bureau in Cairo contributed greatly to the defeat of the Ottoman Empire and to the post-war environment in which Great Britain had power and influence in the region. The legacy of intelligence in the Middle East left by the British operations conducted there cannot be understated. The futures of the Levant, Mesopotamia, and to a lesser extent the Hejaz, were encouraged by intelligence officers and their assessments, including Mark Sykes’ determination of the borders between the new countries that would be created pending the removal of Turkish influence in the region. As well as decisions made by British higher-ups, intelligence operators on the ground influenced the future of the nations that would be created in the post-war environment. Regardless of the longevity of some of the kingdoms established in the aftermath of the Ottoman defeat in the region, the Hashemite kingdoms of Hejaz, Jordan, Syria, and Iraq would owe their existence largely to Lawrence, his vision, and the skilful execution of his duties. Although according to Lawrence the then-Sharif of Mecca and the other tribal leaders of the Arab and Bedouin peoples of the region had the power to execute the Arab Revolt without the British, they were strongly encouraged and ultimately convinced by the British officers on the ground (and their promises & intelligence support) to revolt against the Ottomans. The importance of the intelligence operations in the region during the Great War are highlighted by the role the individual actors had in the shaping of the post-war political climate. Kingdoms and republics rose and fell, influenced conspicuously by British intelligence officers and their superiors. The intelligence practices of the British forces in the Middle East and Arab World during the First World War were varied in methodology but all equally vital to the defeat of the Ottoman Empire. The human intelligence conducted on the ground, by men like T.E. Lawrence, produced intelligence that was useful for both British and Arab forces. These men gathered intelligence from various sources, including friendly local Arabs and from Turkish captives and deserters. Certain intelligence officers, notably Lawrence, also influenced opinion among the upper echelons and popular masses within Arab society. British propaganda and support for Arab independence encouraged the Arab peoples to revolt against the Turks, and it supported British influence both during and after the war in the region. In addition to the great legacy of the intelligence operators on the ground, signals intelligence gathered and analyzed by the men of the Cairo intelligence department was essential to the war effort in the Levant, Mesopotamia, and the Hejaz. They collected intelligence by intercepting both internal Turkish communications in its Arab territories and communications with her allies, particularly Germany. This intelligence was disseminated to and aided both British and Arab forces in their fight against the Ottoman armies in the region. To add to the already impressive record of intelligence officers of the Arab Bureau, the imagery intelligence collected by airplanes provided insight into the location and strength of Ottoman armies and strongholds. Altogether, the war was made possible by these several forms of intelligence gathering and analysis. The enormously successful intelligence campaign in Arabia contributed tremendously to the victory in the theatre of war, and it shaped the post-war political environment of the region. 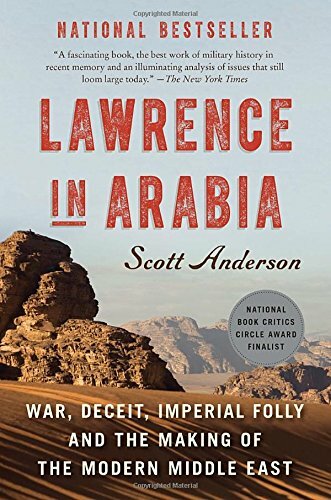 Today's book recommendation is Scott Anderson's Lawrence in Arabia.